As the Ravens attempt to vie for a playoff berth, they may have an issue at quarterback. Joe Flacco‘s now dealing with a hip injury, according to The Athletic’s Jeff Zreibec. Flacco’s status for next week’s game is in jeopardy, Zreibec reports (subscription required). Currently in their bye week, the Ravens are ramping up Lamar Jackson for a possible Week 11 starting debut. Flacco is seeking medical opinions, per Jason La Canfora of CBS Sports, who adds Baltimore’s course of action may not be known until next week (Twitter links). But it may well be trending in the direction of Jackson moving into a starting role for the time being. Zreibec reports Flacco suffered this injury on the Ravens’ sixth offensive play against the Steelers last week. Flacco played through the issue last week and was seen limping in the locker room postgame. The Ravens are obviously concerned their longtime starter won’t be able to take the snaps next week. Jackson has taken snaps this season in specialty packages, as an admittedly uninspired Flacco lines up at wide receiver, but has only attempted 12 passes. The 2016 Heisman Trophy winner completed seven of those. He’s run for 139 yards on 28 carries. 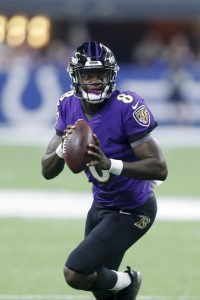 The rookie was not viewed to be as refined of a passing prospect as the four other quarterbacks drafted in the first round, and the Ravens were not looking at promoting Jackson yet. However, La Canfora notes they do want to see more of the Louisville product. That may well happen soon. Home games against the Bengals and Raiders represent the next assignments on the Ravens’ schedule. Flacco has missed just six starts in an 11-year career. All of those came in 2015 due to a torn ACL. Gtfoh Joe, ideally healthy, but gone just the same. We aren’t going anywhere with you, and we prob won’t without you either, but at least we’ll have an opportunity to get some meaningful looks at Lamar to see if there’s a future there. I’d love to see Lamar Jackson get a shot. Could be what the Ravens need to re-energize the team. Generally true but every once in a while you get a Nick Mullens type performance. Gonna have to amputate, you say? So Mrs. Lincoln, other than that, how was the play?